Longtime agency TDA_Boulder created the brand's first big push. It’s not quite the norm for the founder and CEO of a nationally-distributed food brand to be credited with doing his own advertising. 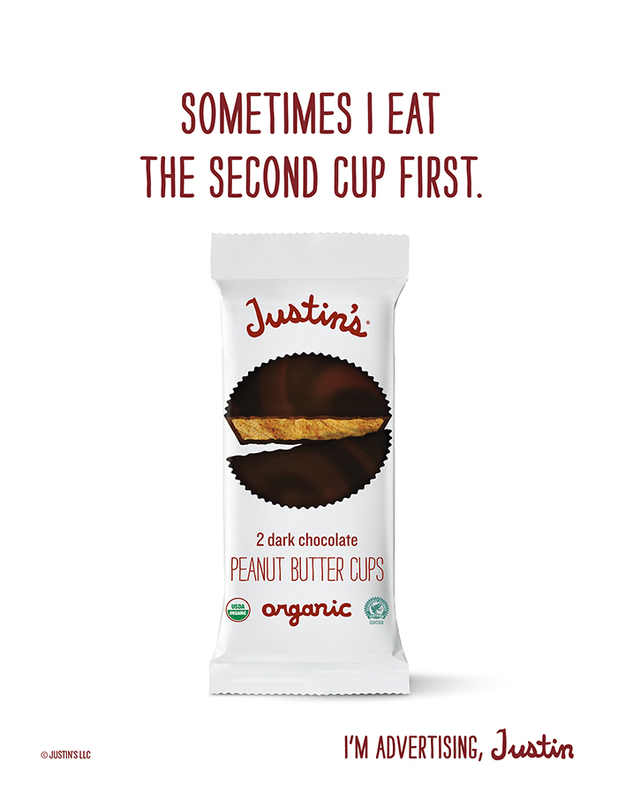 But that’s exactly the point of a new campaign from Justin’s Nut Butter, the cult-favorite of athletes and health-conscious parents. 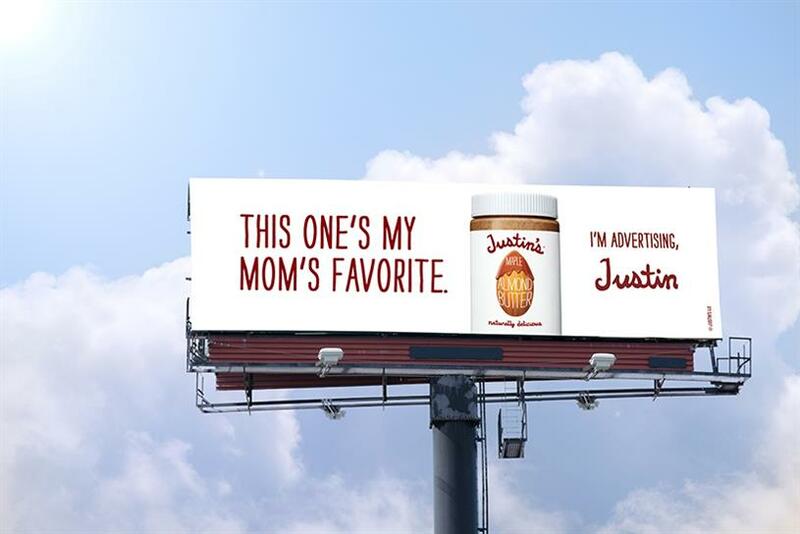 "I’m Advertising, Justin" is the first advertising campaign from the Boulder, Colorado brand, and every one of its slightly sassy taglines is signed by its easygoing head honcho. "The positioning was about not losing the goodness that this all came from," said TDA_Boulder ECD and partner Jonathan Schoenberg. "The brand has grown astronomically, so how do we keep that intact—the Justin’s tribe and [their] idea of inclusion?" TDA has worked with Justin’s for nine years, shepherding the homegrown company through a 2009 packaging redesign that set their identity going forward—simple, approachable and a little cute. As their offerings expanded from pouches to jars to candy and more, their visual identity—white background, illustrated nut, slightly squiggly text—became its own advertising. Copy on all products is written by TDA in Justin’s voice and ascribed to founder Justin Gold. So it was natural that the company’s big debut would build on that precedent. "We created this visual brand, and there was a voice to the brand, which was Justin, and [continuing that] seemed true to what got us all here," said Schoenberg. "Here" is on the brink of a nationwide product push after a $286 million acquisition by Hormel in 2016. It’s a big step for a company started less than 15 years ago by an REI employee who made his own nut butters at home. Gold began selling them at farmer’s markets in snack pouches—a mountain biker, he was tired of eating highly-processed energy gel packs—where they were a hit. The 2009 redesign helped launch a growing slate of products into natural food stores across the country. "Justin made such sacrifices to get the company where it is today, and we love this company and have so much emotion for it," says Schoenberg, who has been a vested partner in Justin’s since TDA’s involvement began. To communicate that love, they kept it simple. Each piece of creative highlights a single Justin’s product, although taken as a whole, the portfolio represents the full range of offerings. There are four different billboards, two print pieces, two spots, and a few migrations to in-store signage. With lines like "This one’s my mom’s favorite" and "Sometimes I eat the second [peanut butter] cup first," all of it is deeply tongue-in-cheek. "The reason I really dig this [campaign] was just the pure stupidity and ridiculousness of a tagline like ‘I’m advertising,’" he says. "I’m really proud of Justin's for buying this campaign." While the creative might be unusual, the rollout is fairly standard fare. "I’m Advertising" includes a digital element incorporating content partners and influencers, social targeting for the spots, out of home in a handful of US markets and print in food mags like "Real Simple" and "Eating Well." As his team wraps up this close-to-home campaign, Schoenberg is taking a moment to relax and reflect on the unexpectedly large strides that Gold and TDA have made together. "It’s a beautiful accident that was the result of hardworking people," he said. "No one wants to screw it up—we just want to keep it going well and be well-received."